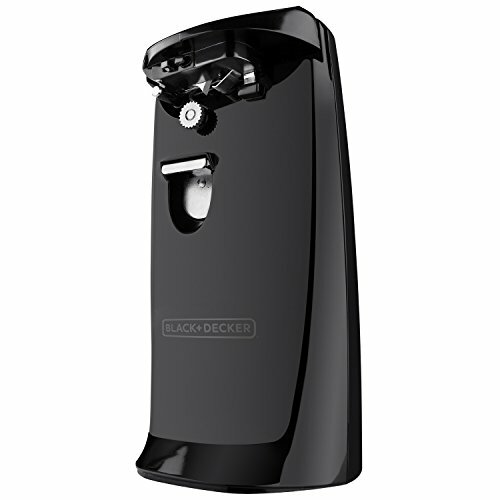 BLACK+DECKER Extra-Tall Electric Can Opener with Knife Sharpener, Black is currently selling at $23.00, approximately $0.06 higher than average, giving a potential saving of $1.00 right now. With a lowest price of $19.99 and an average of $22.94 it is selling on the high end of its usual range. Price volatility is 0.45% (meaning it does not change often), so you might have to wait a while for the price to drop. Right now this product is a recommended 'ok deal'. Compare the current price, savings (in dollars & percent) and Buy Ratings for the top Electric Can Openers that are closely related to BLACK+DECKER Extra-Tall Electric Can Opener with Knife Sharpener, Black. Here is how BLACK+DECKER Extra-Tall Electric Can Opener with Knife Sharpener, Black compares with other leading Electric Can Openers. Simplify kitchen preparation with the BLACK+DECKER Extra-Tall Can Opener. The extended base makes way for cans of all heights and sizes, and the sturdy cutting assembly with a power-pierce cutter opens cans with hands-free performance. Plus, the cutting assembly can be removed for easy cleanup. Other features include a bottle opener, a knife sharpener, and a handy pop-up lid opener. FeaturesRemovable Cutting Assembly - The power-pierce cutting assembly can be removed and reattached for easy cleaning.Bottle Opener - Angled to quickly remove metal tops from glass bottles.Knife Sharpener - Built into the back of the unit with a sharpening angle for both left- and right-handed use.Pop-Up Lid Opener - Detachable lid opener for cans with pull rings and pop tabs.